Amazon made a splash last Friday when it announced Kindle Unlimited: an all-you-can-read subscription service that gives users the “freedom to explore” unlimited titles of the company’s 600,000+ eBooks for only $9.99/month. Dubbed “the Netflix of books,” bloggers and consumers alike have been buzzing about how Kindle Unlimited will change the way the world reads – and downloads – books. Even with so much to read (and so few days in a month! ), there are both pros and cons about the new service. CNET questions how good this program is for Kindle authors, whose works are automatically rolled into the program. Is publicity more important than the profit authors earn when a user reads over 10% of their published work? There are definitely ways to make the most of this program, according to Wired, who suggested five strategies to get the best bang for your buck. Of course, here at Speck we’ve got you covered with mighty slim protection for all of your Kindle Fire e-readers including all-around protective folio covers, wallet folios with hideaway pockets, screen protectors, and more. 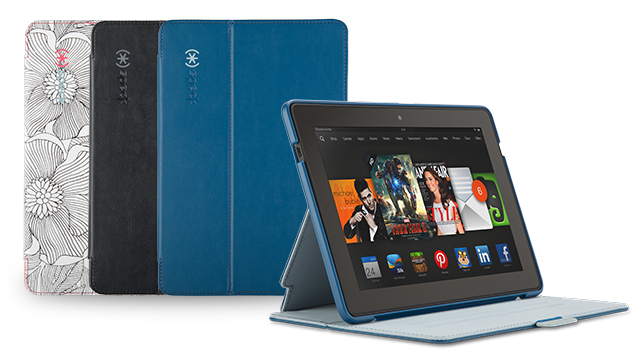 Shop Speck today for the perfect accessory to your Kindle device.